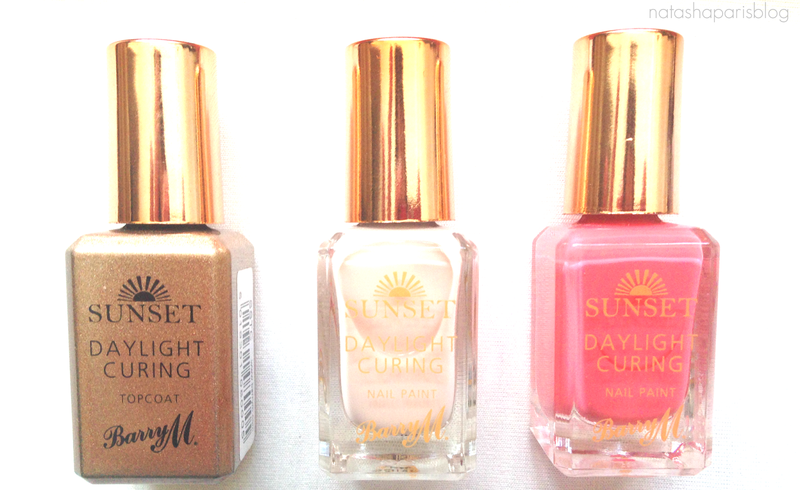 A couple of weeks ago Barry M released a new line to their extensive range of nail polishes - the Sunset Daylight Curing Nail Paints. These nail paints are designed to give the effect of gel nails with much less fuss. The Barry M Sunset Nail Paints apply just like a regular nail polish, but the clever part comes into play when you apply the Sunset Top Coat. Once the top coat has been applied the polish bonds together to create a gel like effect. Unlike most gel nail polishes, there's no need to use a UV lamp with these as they use natural daylight. I can be quite impatient when it comes to letting nail polish dry so I've been seriously impressed with the Barry M Sunset Nail Paints as they seem to dry pretty quickly. Granted this product doesn't quite live up to ordinary gel nails in terms of lasting power but I've found that they last a good 4-5 days without chipping, which I'm pretty impressed with. I'm definitely going to look at picking some more shades up from the Sunset Nails range. If you fancy giving them a try you can find them here (link) where they're currently on offer for 3 for 2. Have you tried the Barry M Sunset Nail Paints? If not will you be giving them a try?